Most people do not get the opportunity to meet an honest to goodness legend. I got to meet one twice. A lifetime ago I was a news producer for a local television station. In my meteroric rise to producing early morning shows, noon newscasts, and weekend news, I had other jobs. My first paying gig was putting together "electronic graphics," which essentially meant I typed in peoples' names so I could later push a button and make those names appear on the screen underneath them. Stuff like "Clyde Sigmond/Puppet Designer". Before I rose to that level, however, I was an intern. And, as an intern the person who did electronic graphics at the time needed me to get the proper spelling of a guest's name. That guest was Phyllis Diller. At that time, I was young and uneducated in comedy history. I liked comedy, but didn't know a lot about it. I certainly had no grasp of the importance of Phyllis Diller. Truth is, I at one time thought she was the antagonist of the Buggaloos, Benita Bizarre. I now know that was Martha Raye. So, while I knew Phyllis Diller was an "old" comic, I didn't know she was a genuine pioneer in the field. So, as I approached Phyllis Diller while she sat in our break room (she may have been talking with Willard Scott, who was inexplicably also there) with my trusty reporter's notebook in hand (do they still have those? I miss those things), I was not nervous or starstruck, because I simply did not know I should be. 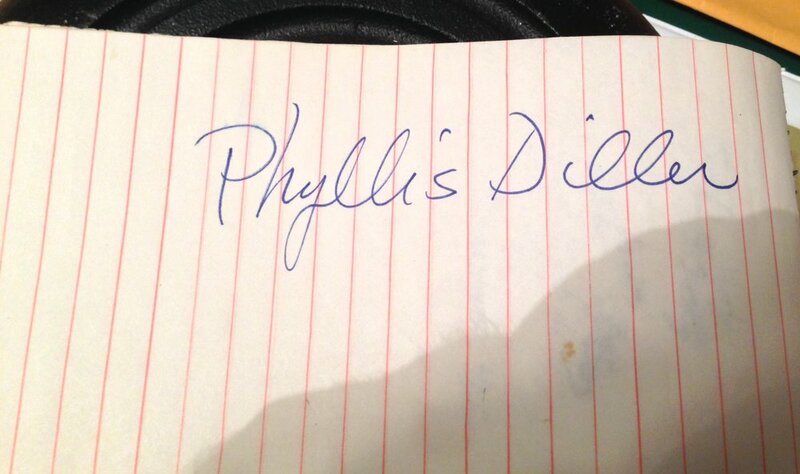 I walked up to her, pen and notebook at the ready, and said "Excuse me, Ms. Diller, can I get the spelling of your name?" She smiled grabbed my notebook and proceeded to give me an autograph. I think she thought I was a nervous fan, and she was very gracious. I took the pad back and thanked her, not 100% sure I could read autograph clearly. But, at that point, I felt like I would be a complete jerk to ask her for the spelling again. Cute enough story. Our next encounter, however, was more harsh. In retrospect, it was pretty easy ro read. Maybe I was more starstruck than I realized. Fast forward a couple of years. At that point I was a producer. Our news director came up to me and asked if I wanted to interview Phyllis Diller. We had a satellite interview scheduled in a few minutes, and he needed someone to ask questions. I fancied myself to be an entertainment guy, so I agreed. He suggested I ask some questions about Bob Hope. That was the extent of the prep I had. Phyllis Diller wasn't promoting anything. There were no projects in the wings. It was simply a chance to interview her. A few minutes later, I was sitting at my desk on the phone. A monitor in the newsroom was turned on so I could see and hear the comedian. This, of course, meant everyone else in the newsroom could as well...anchors, reporters, passing ne'er do wells. Everybody. Between the time I had first met Phyllis Diller and this day I hadn't bothered to learn anything about her. I had about as much knowledge and appreciation for her this go round as I had the first time. I asked some lousy questions. I don't even know what I asked. I am sure I asked what she was currently doing (which was nothing), if she had any memories of Fang (which was about all I knew about her at that time) and some clumsy question to the effect of "So, got any good Bob Hope stories?" It was a terrible interview, but Phyllis Diller gamely tried to answer like a pro, givning me her famous smile and that cackle of a laugh that was distinctly hers.I concluded the interview and hung up. That should have been that. "What was wrong with that guy? He was terrible. He just kind of stumbled around. That was the worst interview I have ever had." Every head in the newsroom pivoted to me. Some people were horrified or upset for me. Others, rightly, thought it was hilarious. From that day on, I declared Phyllis Diller to be my nemesis. I was never upset by the incident. I thought it was hilarious. And, she was right. It was a terrible interview. I should have been embarrassed about my lack of knowledge about the lady's career to ask decent questions, even on short notice. But, truthfully, none of that mattered. Phyllis Diller had declared that she had endured her worst interview with me. In a weird way, I was proud of that. And I was glad to have such a nemesis. Now, of course, I have worked as a comic. I know a bit more comedy history. And I get how incredibly important Phyllis Diller was. 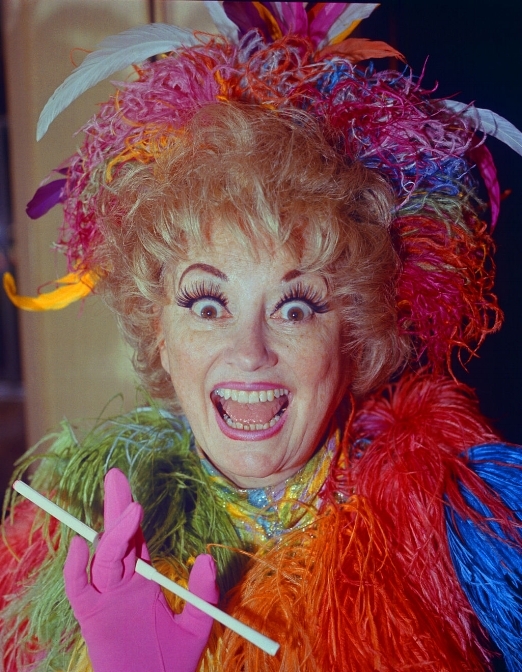 Every woman who has gotten on a stage and done material owes a debt of gratitude to Phyllis Diller. She was by every possible definition a legend and a trailblazer. She was a pro. I am sorry to see my nemesis go. I am sorry I didn't get a chance to meet her a third time and apologize for a terrible interview and for not knowing what I should have known. I am sorry I never got a chance to see her perform in person. But, I got to meet her twice. And I got to hear her call me the worst. And, I have to admit, I am kind of glad I botched that interview, because, truth be told, that insult is one of the fondest memories I have. Thanks, Ms. Diller. I get it now.